There is something completely wrong with the company, when it did not tell me beforehand that two of the few included sights Chaotian Gong and the Sun Yat Sen Mausoleum are closed during Mondays. I was informed that the Mausoleum was closed only after I arrived by train. The guide claimed he told this to the main office, but it was not communicated to me. But even worse, the guide did not even know that the Chaotian Gong was going to be closed until we got there! There was also a heated argument between the guide and the guard at the Confucian Temple, because his papers were not being accepted for his free entry. To be objective, the river cruise was very nice, although it would be better to do in the evenings. The lunch was ok and plentiful. As for the guide, he was earnest in his work. He took me to the Ming Tomb in the same area as the Mausoleum, although I had to pay extra for the admission. He was helpful in getting me to change my train ticket to an earlier schedule due to the shorter tour. But he only gave minimal cultural information during the tour. The driver did not even introduce herself, much less speak to me at all. We had to wait for her for some time after lunch, because her phone was busy. 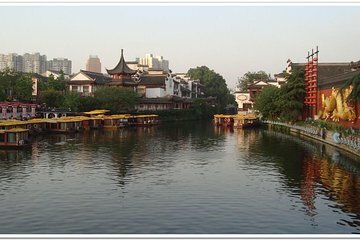 All in all, I think that Nanjing is worth checking out -- just not with this tour company. For the high price that I paid for a private tour, as well as my early time and effort to get there, it's just not worth it to be short-changed.